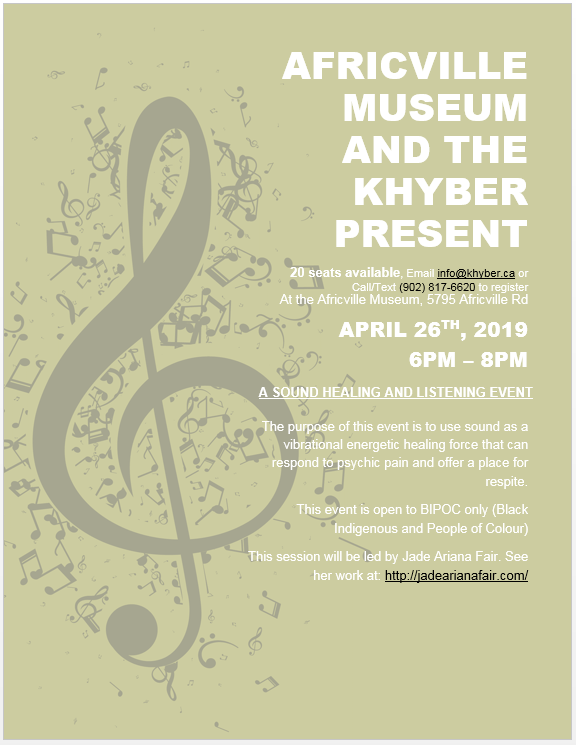 The purpose of this event is to use sound as a vibrational energetic healing force that can respond to psychic pain and ofter a place for respite. This is open to BIPOC ONLY (Black, Indigenous and People of Colour) and will be held at the site of the Africville Church. We will be providing energy work and massage therapy free of charge. Participants are encouraged to bring their own pillows, blankets, yoga mats, etc. however we will have a limited amount available. We are accepting registration for up-to 20 BIPOC participants, which can be done by email to: info@khyber.ca. Please consider that space is limited when registering, and that our intention is to hold space for people who are Indigenous and/or of the African diaspora. Jade Ariana Fair is a multidisciplinary artist living in unceded and occupied Ohlone territory/Oakland, CA. She works across the genre of painting, performance, sound, and installation. She is a socially engaged artist whose social practice extends to arts education with youth and a healing arts practice. She has been making art for as long as she can recall as a form of healing, guidance and self-recovery. She has performed and exhibited work throughout nationally at SOMArts Cultural Center, Berkeley Museum of Art and Pacific Film Archive, Stanford University in the Bay Area, Good Children Gallery in New Orleans, and Public Space 1 in Iowa City. She is a co-founder and co-organizer of The Multivrs is Illuminated, a four day festival of underground, punk and DIY music, art, film and performance by people of color. She was a 2017 resident at the Center for Afrofuturist Studies and her 2018 mixed media collage work was published online at SFMOMA’s Open Space. Copyright © 2012 Africville Heritage Trust. All rights reserved.